We have reached Week 16 of the fantasy football season, and it’s time to look at rankings changers. For the final time this year, let’s take a look at some performances and developments from the week that was around the NFL and check out some of the players who are moving up and some that are moving down heading toward next week’s championship round. Ryan was one of the few quarterbacks to deliver in Week 15 as he threw for 231 yards and two touchdowns while adding another score on the ground in the win over the Cardinals. He has now rushed for three TDs this season after going more than five years without doing it once in the regular season. … It isn’t pretty, but Allen continues to offer nice fantasy production; over the last four weeks nobody has scored more points at the position. During that span alone, the rookie has rushed it 40 times for 351 yards and three touchdowns. … After looking a bit rusty in his first game back in Week 14 against the Rams, Trubisky shined against the Packers, completing 71.4% of his passes and averaging 8.4 yards per attempt. Nobody had a better day on the ground on Sunday than Henry did for the Titans. He got 33 totes and finished with 170 yards and two TDs. He now has 408 yards and six scores rushing over his last two after tallying 474 yards and five touchdowns in his first 12 contests of the season. … As expected, Cook saw an increase in his workload with Kevin Stefanski now calling the plays in Minnesota. The second-year back got 20 touches for the first time since Week 1 and finished with 136 yards and two touchdowns on the ground to go along with one catch for 20 yards. … Mixon is the only weapon left in the Bengals’ offense and over the last two weeks he’s carried the ball 52 times and been targeted nine times while playing 99 of the team’s 147 offensive snaps. 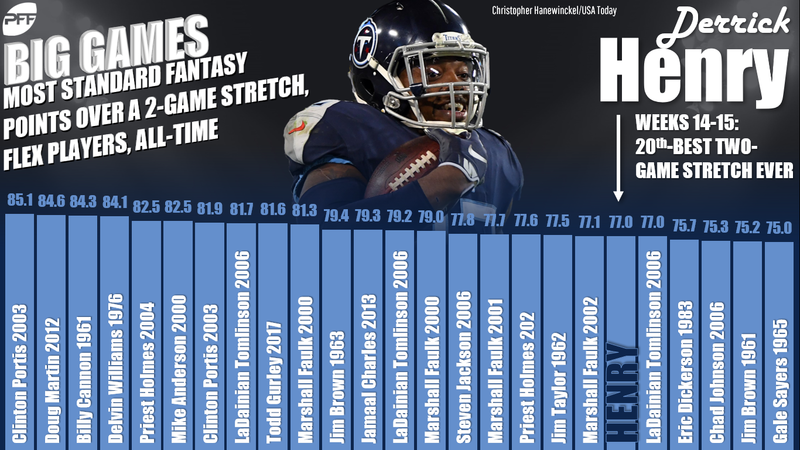 Only Henry has scored more fantasy points at running back during that span. Hopkins single-handedly carried owners to victory in Week 15 as he exploded with a 10/170/2 stat line Saturday night against the Jets. It was just his second 100-yard game since Week 6, but he has now scored in seven of his last nine contests. … After a slow start to the year, Nelson is finishing strong in his first year as a Raider. The 33-year-old reeled in six balls for 88 yards in Week 15 and is offering WR2 PPR production over the last three weeks as he caught 88% of his 25 targets. … Foster went over 90 yards receiving for the fourth time in five contests as he tallied 108 yards and a touchdown on four catches versus the Lions. He joined Sammy Watkins as the only Bills over the last 10 years to have back-to-back 100-yard receiving games. With Odell Beckham Jr. out once again, Engram led the Giants and all tight ends in Week 15 with 12 targets. He finished with eight receptions for 75 yards. A healthy return of ODB could lead to fewer targets, but given the landscape at the position he’s locked in as TE1 the rest of the way. … Everett was targeted seven times as the Rams tried to rally past the Eagles and finished with five grabs for 45 yards. He’s still tough to endorse for fantasy lineups, but Everett as clearly emerged as the team’s most viable option at the position. 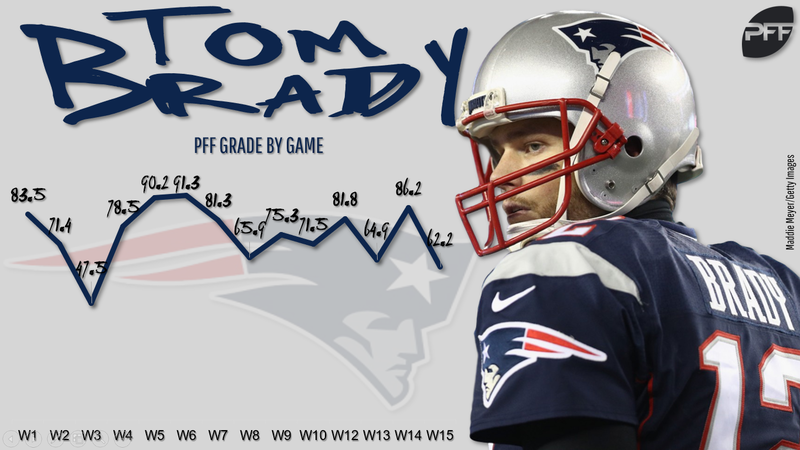 The struggles continued for Brady in Week 15 as the Patriots fell at Pittsburgh. The final stat line (QB19) isn’t as bad as his performance actually was. His timing appears to be off and he’s not performing under pressure as well as we’ve grown accustomed to. … After throwing for three scores or more in eight straight games, Luck has now gone without a TD pass in two of his last three game while topping 250 yards just once during that period. … Goff put up another goose egg in the TD column and now has thrown one TD over his past three games. With opposing defenses taking away the deep ball, the Rams’ passing attack has stumbled as evident by his dismal 5.5 yards per pass attempt in that span. Fournette turned out a second straight dud. Owners who were fortunate enough to survive despite his poor performance a week ago were rewarded with a 46-yard effort on 11 carries and three catches for 18 yards. After a great first three games back from injury, he’s failed to reach double digits in each of his last two. … The Patriots’ offense is sputtering as a whole and Michel’s numbers are following suit. Despite seeing 50 carries over the last three games he’s totaled just 179 yards while going scoreless. … In the two games since Emmanuel Sanders went on IR in Denver, Lindsay has managed just 54 yards on 28 attempts with 1.93 yards after contact per attempt. He only netted 24 yards on 14 carries in the team’s loss to the Browns. 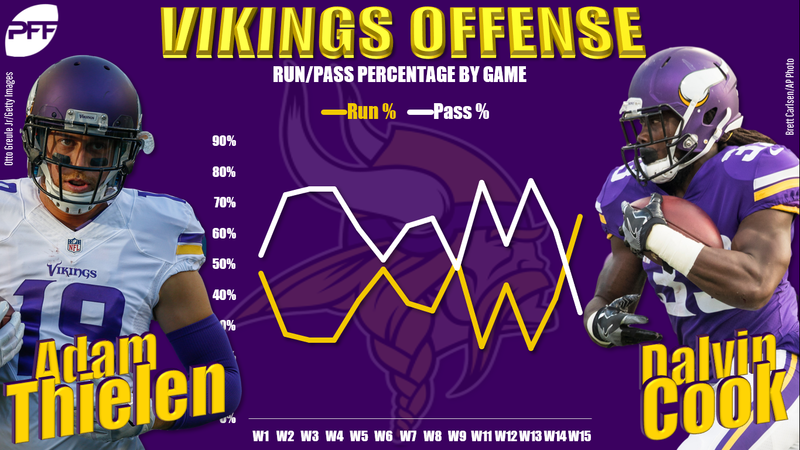 With the Vikings committing to the run, Thielen yielded a season-low in targets (2) and receiving yards (19). After starting the season with eight straight 100-yard games, the wideout has missed the mark in five of his last six efforts. … Gordon yielded his worst fantasy day in Patriots’ uniform as he pulled in one of this two targets for 19 yards. While it hadn’t been flashy, Gordon had at least reached 12 PPR points in four straight before Sunday’s dud. … The formula of DeSean Jackson being out leading to production for Godwin failed for the second straight game in Week 15. He didn’t pull in any of his three targets against the Ravens after only catching one of the 10 balls thrown his way a week earlier against the Saints. Despite a long history of success against the Steelers, Gronkowski fell short of expectations in Pittsburgh in Week 15 as he caught two passes for 21 yards. He was coming off his best game of the season a week earlier but didn’t even make his first catch until the fourth quarter in this contest. … Brate is the quintessential TD-or-bust candidate on a weekly basis. He has scored in five games this season, reaching double-digit PPR points in four of them. In the eight games he’s gone without a score he’s only averaging 3.3 points per game.